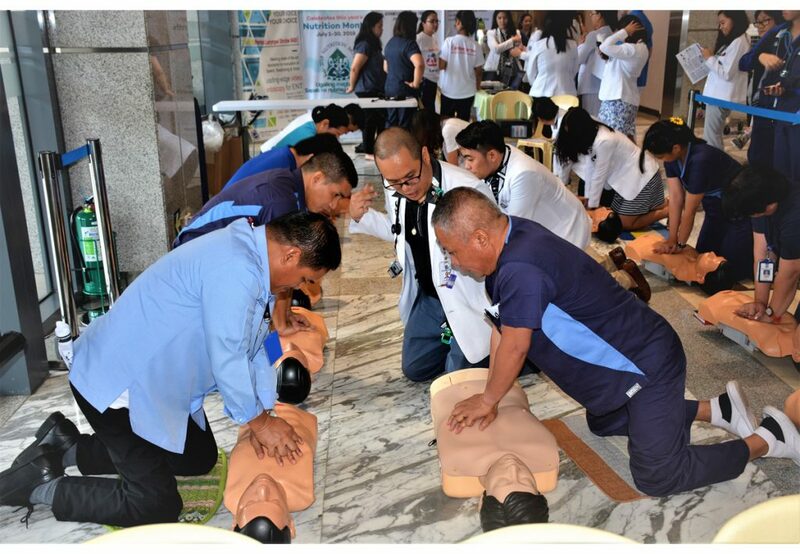 As part of the hospital’s Safety Promotions and Disaster Preparedness Committee Activity for the Disaster Resilience month of July , a Mass CPR activity was held at the North Wing Kalaw Lobby of Manila Doctors Hospital . The activity aimed to teach basic Cardio Pulmonary Resuscitation (CPR) – a basic lifesaving technique which can be used in many emergencies in which someone’s heartbeat or breathing has stopped. The American Heart Association recommends that everyone — untrained bystanders and medical personnel alike — begin CPR with chest compressions. The Mass CPR was participated in by more than 300 MDH staff and outpatient and was successfully launched in collaboration with the Philippine Heart Association ,Inc. Philippine College of Cardiology. Remember, the difference between your doing something and doing nothing could be someone’s life.